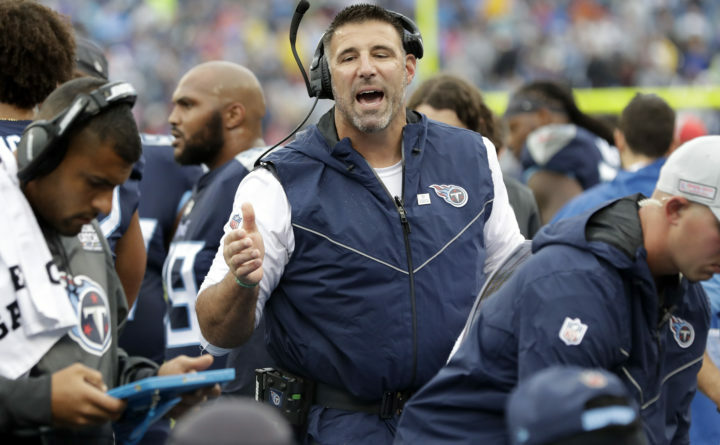 In this Oct. 14, 2018, file photo, Tennessee Titans head coach Mike Vrabel talks to his players in an NFL football game against the Baltimore Ravens in Nashville, Tenn. Mike Vrabel won three Super Bowl rings playing linebacker and goal-line pass threat for Bill Belichick in New England. Now the rookie head coach gets his first crack at his former coach when Vrabel's Titans host former teammate Tom Brady and the Patriots in a game Tennessee desperately needs. “They’re hard-nosed. They care about the fu ndamentals,” Ryan said. GRONKOWSKI STATUS: Whether Patriots tight end Rob Gronkowski starts will be determined by the coaching staff as he has missed two of the last three games due to back and ankle injuries. Gronkowski was limited in practices this week. MERRY-GO-ROUND: Tennessee has to be ready for an unconventional look in the Patriots’ backfield. With rookie Sony Michel nursing a knee injury the past two weeks, receiver Cordarrelle Patterson has emerged as New England’s go-to threat at running back. Patterson led the Patriots in rushing each of the past two games, including 61 yards and a 5-yard touchdown last week.